Order the fish you want, and get it the way you want it! Our fish list goes out to subscribers in the morning three days a week: Monday, Wednesday, and Friday. Reply to fish@crackercheese.com with your order. We confirm it or follow up with questions by 8pm. Our distributor in Chicago works with suppliers and fishermen to deliver the freshest fish right to our door the next day. We only order product that meets our high standards of quality, sustainability, and freshness. Unlike other fish retailers, our fish never sits in a secondary warehouse or gets trucked to distribution centers -- we get it the day it comes off the plane from the source. Taste the difference. Your specific order arrives the next day, where we prepare it in house. At Cheese & Crackers, we hand-cut and portion your fillets and prepare your order. ﻿ We have everything ready to go by 2p.m. We can cook your shrimp or lobster, too, for a small additional charge.﻿ Come in and pick up, it's that simple! We welcome you to come in and see for yourself how good our fish is. 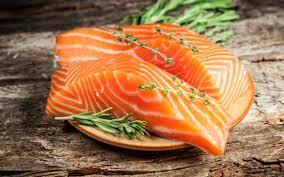 Fresh Salmon: Quality salmon farmed by producers around the world. 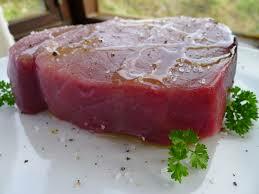 #1 Yellowfin Tuna Sushi Grade -- this is the best of the best, wild Yellowfin Tuna. The highest sushi grade. We hand-cut each piece. #2 Yellowfin Tuna Sushi Grade - Very good sushi grade tuna, also hand cut, a fantastic sushi grade tuna, just not as perfect in color and fat as the #1-- still far better than the typical #3 grade you get at most restaurants and fish markets. This is an excellent sushi grade tuna. Responsibly Farmed Fish -- Aquaculture is a sustainable way to preserve the world's fish populations. It takes pressure off the environment, assures a quality fish product, and sustains fishing communities. We carry only the finest farmed fish. Fish Scrap (Red) Order by the pound, this may include heads, collars and other scrap of fish that are dark such as Tuna and Salmon. Ideal for a variety of fish stock. Will not include light fish scrap from white fleshed fish. Acme Nova Lox - Acme in Brooklyn New York is a 4th generation family owned company that has been making Nova Lox for over 100 years. No one on earth makes Nova like Acme - the best of the best and the choice of top chefs everywhere. Sold by the pound. Huge Diver Dry Scallops - no solutions added! 10 scallops per pound, on average. These are the largest diver Dry packed scallops you can get. Nothing sears as well as these. Dry Bay Scallops (Wild Atlantic). These smaller scallops are perfect for a variety of culinary applications. Shrimp -- We can order shrimp in a wide variety of sizes (sized by the number per pound) and can have them dressed to order (tail on or off, shell on or off, deviened or not). Below we have listed the most commonly ordered shrimp. Massive American Shrimp 4-6 shrimp per pound, shell on (from Louisiana)•What a treat. These are almost like tiny lobsters -- fantastic boiled or broiled. Sweet and tender. Great for a holiday meal as a first course or appetizer. Wow them! Small Shrimp 41-50 per pound, peeled and deveined. Clams the sweetest, freshest clams in town. Tip: Soak your clams covered in cold water and a tablespoon or two cornmeal for 30 minutes prior to cooking, allowing the clam to filter out any sand that may have accumulated. Right off the plane tomorrow morning! Our lobsters are fresh from the North Atlantic; they have not been sitting around in a tank losing body weight for days; resulting in a significantly larger amount of meat with a fresh lobster. Yes, we can get those huge 4+ pound lobsters (Lobsters over six pounds can be pre-ordered, but may need a few days depending upon the harvest). Fresh Cooked Lobster Meat (not canned, and not pasteurized) Sweet, perfect lobster meat ready for eating on its own or incorporation into your favorite lobster dish. A 1 1/4 pound whole live lobster yields approximately 4oz of meat; so buying fresh lobster meat is a really great deal - lower cost and no steaming, cleaning and picking out the meat yourself. Fresh Crab Meat Not Canned, Not Pasteurized, Not Frozen - (Handpicked Peekytoe Jonah crab). A special order, this one is seasonal. Alaskan King Crab Legs - These are the big boys - you can buy the small Alaskan King crab legs that contain a thin pencil of crab anywhere in town - but my crab legs are the huge ones. Thick, sweet crab - just warm and serve. We suggest steaming them for a few minutes. Crab legs are graded by the number per 10 lbs - our legs are 6-8 legs per 10 lbs which are the largest size. More meat per lb, good value for the money. Fresh oysters are notoriously fickle in availability. Please see our current email fish list for varieties that are being shipped now. We can order a large selection of both domestic and imported caviar. Please inquire if you have a specific request, we can certainly get it for you.